Flat tyres can be a real pain. They always happen at the most inconvenient times, requiring you to stop, pull your wheel out, get your repair kit out from your bag, get your hands dirty, throw out a tube and pump your tyre up again. Luckily some tyre manufacturers spend their money on lots of research and development to provide us with the strongest, lightest, most-durable construction materials so we can roll fast and without punctures. Schwalbe is my touring tyre brand of choice, and this is a guide to the five best bike touring tyres in their range. Durability – How long will this touring tyre last? 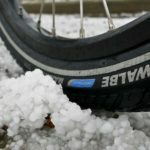 Puncture Resistance – What will it take to puncture this touring tyre? Grip – Will this touring tyre grip the surfaces you’re riding? Speed – How fast will this touring tyre roll? The Almotion is Schwalbe’s latest touring tyre, and they’ve made it their fastest by making it tubeless compatible. Not only is it fast, but it also offers excellent puncture resistance too. This is probably the touring tyre of choice for tours that are mostly on sealed roads. Weight: 655g (700×38). The Mondial is, hands down, the best touring tyre you can buy, and I can vouch for them as I’ve completed over 25,000km on a single set before deciding to replace them! They’re quite fast rolling too, considering they have good off-road grip. You can read my Mondial review HERE. Weight: 650g (700x40c). The Supreme is 25% lighter than the closest equivalent, the Almotion. That makes it a great choice if you’re riding sealed roads and you’re loaded up really light. When compared to the Almotion, the trade-offs you’ll be making include reduced puncture resistance and reduced off-road grip. Weight: 490g (700×40). The Marathon Plus tyres are part of Schwalbe’s ‘flatless’ line, giving them the title of most puncture-resistant touring tyre available. I’ve completed 20,000km+ on Plus’s without a single puncture which seems to back up that claim. The secret ingredient is the SmartGuard layer which is made from a special rubber that offers a 5mm buffer to shards of glass and other shrapnel. Even a thumbtack is not long enough to penetrate this protective layer. Given the additional weight of this tyre, it doesn’t roll as fast as it’s competition. Weight: 960g (700x38c). This grippier version of the ‘flatless’ Marathon Plus is designed for those who prefer unsealed roads. Again, it’s not a lightweight, so it will not roll as fast as many other tyres on this list, but it is the most puncture resistant option available. Weight: 940g (700x40c). Which Tyre Should You Select? If you’re still having a hard time still picking a tyre, these are my recommended options based on the type of riding you’re doing and how much gear you have.